With CEO Mark King being moved to a bigger job within adidas Group, TaylorMade-adidas Golf and the golf industry are losing a major player in the day to day business of golf equipment. His replacement Ben Sharpe has equipment experience in Europe for TaylorMade but King will be hard to follow. King is taking over as President of adidas Group NA on June 1, a job that encompasses responsibility for adidas and Reebok in North America and an oversight role for TMaG. His 33 years at TaylorMade years began as a salesman and ended with the company being the largest and most profitable in the industry. When he took over as president in 1999 sales were $339 million increasing to $1.7 billion last year. He made many significant contributions to how the game is played but unquestionably his biggest was an early understanding of the improvements technology could make. King pushed hard to build arguably the best research and development department in golf with player adjustable weighting for drivers being is a prime example of their forward thinking. It rocketed TaylorMade to the top in metalwood sales, a position it still holds. Primary position in iron sales followed though they still are trailing Titleist in golf ball sales and Callaway Golf’s Odyssey division in putters. King also was intuitive about what he called “Tour validation,” the promotion of company products by having the largest number of professionals playing them so consumers would be aware of them every week. He has conceded the rush to provide new products for the 20 percent of core golfers who are frequent purchasers of new clubs has made waves with both competitors and retailers. TMaG in the past three years has introduced “new and improved” clubs, particularly drivers, as often as twice per year taking advantage of their R&D position which can’t be matched by other club companies. However, after all the discussion much of it critical by outsiders, golfers buy TaylorMade clubs for a simple reason. It is not hype nor as some competitors say with a derogatory sneer “marketing” but a belief TMaG gives them the best performance. Certainly an enviable position to have achieved. King has also been outspoken in his comments about what has become an industry buzz phrase, “Growing the Game.” He has stated publically current efforts to bring more players into golf are simply rehashing the same old ideas by the same people over and over again. Putting his company’s money where it counts King announced in January an entirely new program to find ways to expand the number of golfers in nontraditional ways by committing $5 million to Hack Golf. It’s still too early to measure success or failure but Hack Golf at least is not the same-old-same-old. 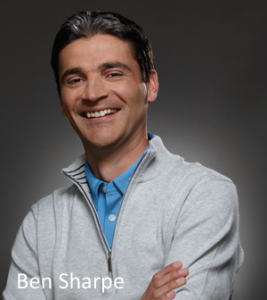 The question is how will the change to Sharpe’s leadership effect the company and the industry? He seems qualified including firsthand knowledge of the golf business plus competitive sports having been an Olympic field hockey player in 2000. The industry needs strong leadership and Mark King supplied it.